Green and Gold Energy, the Australian producer of rooftop concentrating solar PV units, was forced to make design changes to its units. They were unable to maintain the manufacturing tolerances that they required for their hemispherical Sunball unit and have switched to a cubical design. 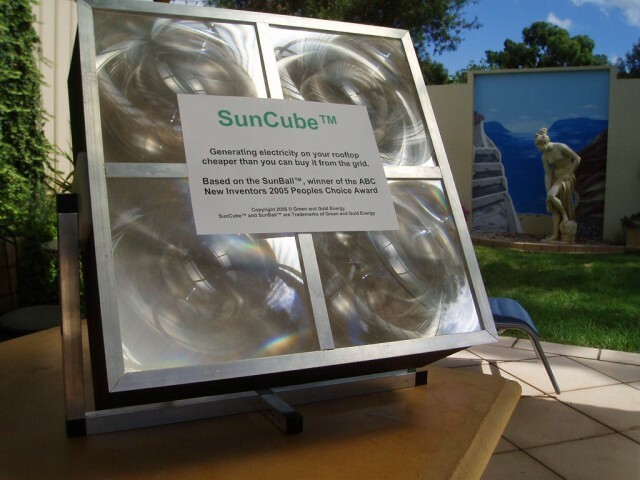 They discovered that the cubical design, the SunCube(tm), was less expensive to produce and have reduced their prices accordingly. As a result of these changes the shipment of the units has been delayed to the end of April. A previous update of their Sunball unit can be found here. According to the information that is contained on their website and discussed in the Sunball Yahoo forum, their systems, without subsidies, will generate electricity at a lower cost than is generally available from a utility. They have assumed a 25 year life and a 6.5% interest rate. The initial capital costs are significant if paid out in cash, but if rolled over into a mortgage it is a excellent investment. A 2 x 2 unit consisting of 4 modules is shown in the photograph. A 150 W unit consisting of nine modules in a 3 x 3 arrangement will be the first unit to go into production with a 330 W 4 x 5 unit to follow. Units with other combinations of modules will also be available (2 x 2, 3 x 2, 3 x 4, etc) Systems consisting of several units with a total capacity of 3 kW will also be available, complete with inverter. Systems to be installed in Australia are also available at prices that include the installation charges. The following announcement was made regarding the status of their production. "The initial capital costs are significant if paid out in cash, but if rolled over into a mortgage it is a excellent investment." In other words, how much does the system cost, how much does it produce, what is the value of electricity needed to produce a payback, what is the rate of return on the investment? How does that overall rate of return compare to alternative uses of the same quantity of debt? Eureka! The tracking element of these designs is the only weak point. I think the 10 suns needed to get close to 40% efficiency is possible without tracking, even on cloudy days. What do you figure new nukes will cost Rod? I'm guessing 10 or more dollars per watt. That's 10 billion for a typical 1000 mw plant. That's with all the hidden government sibsidies. Immunity from liability for owner/operators and responsibility for waste. In fact nuclear power companies have sued the fund accumulated to handle long term disposal and storage to pay for their temporary nuclear fuel rod storage pools. Long ago depleting that fund payed into by nuclear power consumers. My point is: Who even knows the real cost of nuclear power plants in the short run or the long run, it's all very mysterious as are most coverups of criminal conspiracies. Rod, from their website, follow the link to the bigdiff.xls spreadsheet. They assume financing at 6.5%, installed cost of $12,750, $1,200 annual electric bill, 25 year life, and 6,000 annual KWh produced. The unit shown in the photograph must be a dummy because it cannot possibly work. It has only one axis of rotation. Two-axis tracking is required with its style of lens. It is pretty amazing that the product will be production worthy in less than a month. By the way the optimal concentration ratio for a non-tracker is about 1.7 suns. That is the optimal compromise between concentration ratio and annual intercepted radiation (per Leutz & Suzuki). 25 years is a long time for anything with moving parts - or any plastics (like those lenses) that must maintain transparency while exposed to UV. The SunCube is a two axis tracker, they state this on the website and it can be seen on some sketches on their forum. As far as the optimimum concentration ratio, it is not the optimum from an optical viewpoint, it is the optimum from a cost viewpoint when you are comparing an expensive solar cell to a very inexpensive lens. Most solar PV concentrators use a fairly high concentration ratio. PV concentrators are more sensitive to being pointed directly at the sun than solar panels and they can collect more dawn and dusk energy because of this and therefore have to use solar tracking to be competitive or lower cost than panels. $1000/kW is not the magic number, for a home mounted unit, as far as I am concerned, it is higher. Conventional coal power plants cost $1,400-1,500/kW to build with emission controls. IGCC plants cost $1,600/kw but that is expected to come down. New nuclear plants are supposed to be around $1,600/kw, but that does not include fuel disposal. Fossil fueled plants also have a fuel charge while solar doesn't. The lower initial cost for fuel for nuclear makes them competitive with coal. Data taken from Investing in Megaprojects. You also have to pay a considerable price for distribution charges and distribution losses in a utility power plant. The cost of of SolarCubes and many solar plants is forcast to go down to the $1,000 range when produced in 500 MW or larger quantities. Green and Gold's (GGE) prices are for home or distributed power applications where distribution charges are nonexistant. GGE also use a 6.5% interest rate which is consistent with home mortgage rates, while, according to the above reference, generally use a 13% carrying charge. The wild card is plant life which is taken at 30 years for fossil fueled plants and usually at 20 years for solar plants. Whether using 25 years for the lifetime of GGE's lenses or their tracking system is reasonable is not known at this time, but they are claiming extremely low replacement costs for the components. I don't think that I could come up with a number that all of you would agree was a fair number to use for comparison, but maybe this background helps you understand the discussion a little better. There are plenty of investors and accountants that know exactly what nuclear plant operating costs are. That is not the topic of this post however. I am merely trying to determine what numbers back up the claims of "an excellent investment" for a solar system. So far, I am not convinced, but perhaps that is because my standards for investments are a bit higher than some other people's. Yikes, their website is a total mess. Does not instill confidence. A quick note: their spreadsheet appears to be in Australian dollars. The system installed cost in US dollars would be about $17,800. Yep Rod, I know your standards for "an excellent investment". Energy systems where homeowners,taxpayers, consumers, and future generations pay for all of the huge hidden costs, namely nuclear power. While corporations that specialize in bribing government officials skim huge profits off the top and declare chapter 11 when the radioactive contamination needs cleaning up. They use a very simple method for calculating cost per kwh: they add the interest on a 5 year loan to the total installed cost, and divide by system life, to get the annual cost. They then divide annual cost by kwhr production. Unfortunately, this mostly neglects the time value of money by charging only for 5 years of interest. Their method gives a cost/kwh of $.098, where the real cost/kwh is just about double that, or about $.20. That's still one-third lower than comparable PV costs, and cost-effective (barely) without subsidies in Japan and parts of California. If the costs can be reduced with greater production, they probably have a winner. The main issue for us in the states, though, is that shipping is an extra cost which will drive the per KW price pretty high. So while we wait on someone to enter into joint venture with them and open a plant in the US, Australians will get the benefit of cheaper consumer-oriented photovoltaics. Not to mention, I wonder how many homeowners' associations would allow a bunch of those on a roof - nine of the big ones for each 3 KW needed so that would be at least 18 of them. States? We might be interested. I have tried contacting you before via the e-mail address on the plug-in hybrid blog but got no response. So I'm tring this to get your attention. Nearly a year since the last post. Best to check yahoo sunball forums. But for you all, the SunCube is finally about to be officially launched in April! The guys there have put a nice solar setup on the roof of their premises then will be manufacturing for a solar farm in northern SA. They have a number of manufacturing licensing agreements, incl. QLD, NSW, Isreal, India, Spain/Portugal, Malta with a number of others in the pipeline, incl. USA. So it won't be long now, I believe around July, when they start to become commercially available for all of us who want to generate completely our own electicity. A 6,000kWh setup will be about AU$15,000. Can't wait! The claimed performance figures are pure fiction. Not one single sunball or suncube has ever been installed. Greg is a serial scammer, see his previous deluded invention the SMOT perpetual motion machine. For me it is a kind of difficult situation to believe the data reported in this article. This is a great stuff I know, it refreshes mind and soul. Thanks keep going like that. Investment in renewable energy rose some 60 percent in 2007, according to the UN Environment Porgramme. According to the article the stated goal is to reduce the delivered cost of rooftop generated photovoltaic electrical output to below that available from the grid. Getting cash for gold coins is a simple process. Once you learn about the gold industry, you will see that obtaining cash for gold coins can be a positive experience.